In response to various market driven pressures, many manufacturing companies chose to develop services and solutions complementing their products, so-called integrated product-service offerings, with the aim to better compete with and to differentiate from competition. In essence, servitizing manufacturing firms are innovating with respect to their business model, and, from a business ecosystem point of view, cause new competitive dynamics to emerge, thus limiting the ability of incumbent service providers (ISPs) to adapt and protect their service business models for sustainable value capture. This research project investigates this problem by combining insights from the servitization and IP management research streams. The goal is to understand how ISPs can apply IP management strategies to protect and adapt their competitive position when manufacturers servitize, thus challenging the established competitive landscape in the affected services industry ecosystem. This will be accomplished by first investigating the challenge mechanisms that servitizing manufacturers exert on a services business ecosystem, subsequently by identifying IP management strategies utilized by service providers, and finally by combining these findings to develop a framework of IP management strategies for ISPs being challenged by servitizing manufacturers. 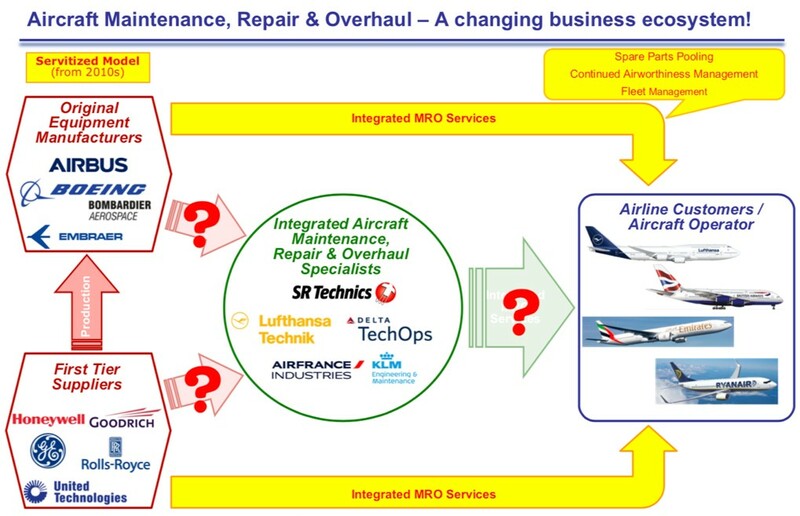 The primary focus of this project will initially be the commercial aircraft maintenance, repair and overhaul industry sector (see Figure 1 below), but a generalization to other industry sectors will be sought.